The majority of patients with irritable bowel syndrome (IBS) are suggested to have small intestinal bacterial overgrowth (SIBO) based on the results of lactulose hydrogen breath testing. Several studies have questioned the ability of this test to discriminate between patients with IBS and healthy controls. Nonetheless, the use of the LHBT in IBS patients has led to the wide spread use of antibiotics to treat IBS in some countries. When IBS patients undergo combined LHBT and 99mTc scintigraphy, the 99mTc is found in the caecum before the LHBT becomes abnormal in 88% of cases. The oro-caecal transit time is approximately twice as long in constipation-predominant IBS patients than diarrhoea-predominant patients. The results of LHBT in IBS patients can be explained by variations in small bowel transit time as apposed to SIBO. Therefore, antibiotics are not indicated for the treatment of IBS patients based on the current understanding of the pathogenesis of this disorder. Differences in small bowel transit time may play some role in the expression of IBS subtypes. Previous studies have suggested that the specificity of the LHBT for detecting SIBO in disorders traditionally associated with bacterial overgrowth (eg, short-bowel syndrome, chronic pseudo-obstruction, scleroderma) can be significantly increased by simultaneously following a 99mTc meal with scintigraphy. With this combined testing it can be determined whether the rise in H2 in the breath test occurs before or after the test meal reaches the caecum.18 We proposed that the inability of the LHBT to discriminate between healthy controls and IBS may be due to variations in small intestinal transit and that the combined use of scintigraphic scanning with the LHBT could resolve this dilemma. Consecutive patients seen with Rome II positive IBS in the Gastroenterology Outpatient Department at Hotel Dieu Hospital were asked to participate by the investigators. Patients were also recruited from a list of patients who have participated in previous IBS trials. Patients were excluded if they had any antibiotic use within 4 weeks of the breath test; any use of laxative, stool softener, or stool bulking agent within 1 week of the test date; undergone a test that requires cleansing of the bowel within 1 week of the test date; any drugs that affect gastric emptying (metoclopramide, domperidone) and antispasmodics within 3 days of the test date; any use of narcotics or sedatives within 2 days of test date; and any concurrent GI illness. The study was approved by the Queen's University Ethics Committee and all patients gave informed written consent. Each subject completed a validated Rome II questionnaire19 which was used to determine their IBS subtype. The patients also completed a data sheet which recorded age, gender and duration of disease. Subjects fasted in excess of 10 h before the test. After providing a baseline H2 breath sample, patients ingested a test meal consisting of a single packet of Kristalose (Cumberland Pharmaceuticals, Nashville, Tennessee, USA), containing 10 g lactulose and 0.3 g galactose/lactose (caloric content=0.5 calorie), mixed with a solution containing 20 MBq 99mTc-sulfur colloid (0.2 ml) in 100 ml of water. Subjects used 30 ml of antiseptic mouthwash immediately before the procedure to eliminate the possibility of lactulose fermentation by oropharyngeal bacteria. Other extraintestinal influences on breath hydrogen concentrations, such as cigarette smoking and hyperventilation, were avoided during the test. Subjects fasted for the duration of the test. Immediately after ingestion of the test meal, subjects were placed recumbent under a General Electric Starcam XRT γ camera (General Electric, Mississauga, ON, Canada) equipped with a low-energy general-purpose collimator. Anterior and posterior 128 × 128 matrix, 2 min abdominal images were acquired every 10 min for up to 3 h, or until radioactivity was clearly visible in the transverse colon. All data was stored and processed on a GE Xeleris workstation. A caecal region of interest (ROI) was drawn on the image that best displayed the caecum. Using the Xeleris ROI copy/paste tool, the ROI was copied onto all the anterior and posterior images. Care was taken to ensure that no caecal region of interest included overlying loops of small or large intestine. Geometric means of radioactive counts obtained from corresponding anterior and posterior ROIs were determined to compensate for tissue attenuation. The radioactive counts were decay-corrected to compensate for physical decay of the isotope. In similar manner, total colon ROI were drawn and corresponding counts were obtained. Any regions of colon that were not visibly separated from small bowel activity were excluded from the total colon ROI. Total gut radioactivity was calculated using geometric means of the decay-corrected counts of the entire image. Image processing was performed by an experienced nuclear medicine physician who was blinded to the LHBT results. Using the Quintron 12i Microlyzer (Quintron Instrument Company, Milwaukee, Wisconsin, USA), end expiratory breath samples were collected concurrently with the scintigraphic images and analysed for H2 concentration in parts per million (ppm). Proponents of the IBS-SIBO hypothesis (Pimentel et al12) refined the definition of an abnormal test as a rise of >20 ppm within 180 or 90 min and discarded the traditional double peak criteria because of its lack of validity.13 20 Therefore, we considered a LHBT to be abnormal if there was a H2 rise >20 ppm within 180 min and also examined those which were abnormal within 90 min. For comparison, we also analysed the LHBT using the traditional double peak criteria. In this case, an abnormal test was defined by a 12 ppm increase in breath H2 over baseline with a decrease of ≥5 ppm at two or more points before the second peak.12 15 16 The LHBT results were interpreted by an experienced gastroenterologist who was not involved in the study and blinded to the results of the SOCTS. Previous studies17 18 21 suggest that a ratio of total colon to total gut radioactivity of ≥5% (ie, ≥0.5 g of lactulose) at the time of the abnormal LHBT (ie, rise in H2 >20 ppm) demonstrates a colonic source of the hydrogen production. Therefore, the LHBT/SOCTS was considered to be negative (normal) if there was ≥5% colonic to total gut radioactivity at the time of an abnormal LHBT. To determine the oro-caecal transit time (ie, time at which the head of the test meal reached the caecum), positive caecal radioactivity LHBT/SOCTS was defined as an exponential rise of the radioactive counts in the caecal ROI requiring at least 100% increase of radioactive counts between two consecutive time measurements with a minimum of 500 radioactive counts (see figure 1B). The lag time between the arrival of 99mTc in the caecum and the subsequent significant rise in hydrogen was measured by calculating the difference between the time caecal radioactivity was positive and when the LHBT became positive. The lactulose hydrogen breath test (LHBT). (A) Schematic drawing demonstrating the basic concept of the LHBT. Lactulose, a non-hydrolysable sugar, is ingested and transits the small intestine. It undergoes fermentation when in contact with ‘colonic-type’ bacteria and H2 gas is absorbed and expired in the lungs. Sequential breath samples are analysed for the concentration of H2, in ppm. Previous studies used two main criteria for studies of irritable bowel syndrome (IBS), outlined on bottom right. 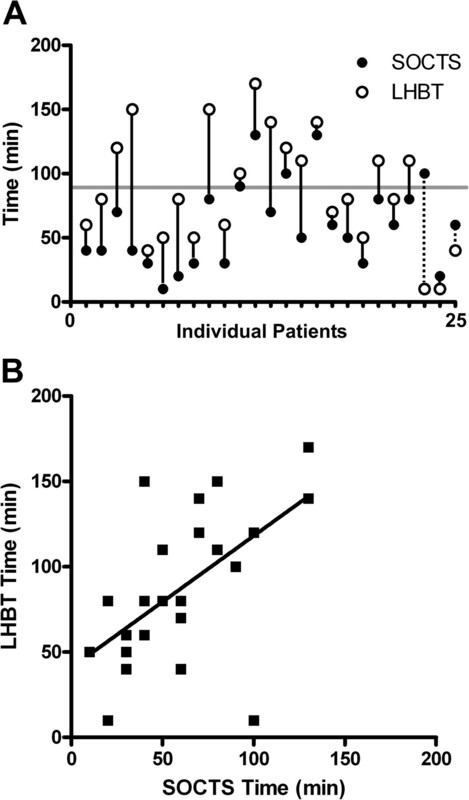 (B) Proportion of patients with IBS and with an abnormal breath test based on 180 min, 90 min and double peak criteria. (C) Time from ingestion to an abnormal H2 level (in ppm). Based on previous studies8 we estimated that at least 60% of the IBS patients would have a positive LHBT at 180 min. Furthermore, we believed that at least 85% of the patients with a positive LHBT would have a negative LHBT/SOCTS (≥5% 99mTc in the colon at the time the LHBT becomes positive). Under these assumptions, 40 patients (ie, at least 24 with positive LHBT) would achieve 97% power at a one-sided α=0.05 to reject that ≤50% of LHBT positive patients have a negative LHBT/SOCTS. Patients who had a positive LHBT and a subsequent negative SOCTS are presented with 95% CIs based on the exact binomial distribution. Furthermore, a one sided exact binomial test was performed at α=0.05 to reject the null hypothesis that the true proportion of patients with a negative SOCTS is ≤50% in this subgroup. Correlation test of the LHBT and SOCTS was performed using GraphPad Prism (version 5). Differences in the transit time of the constipation and patients with diarrhoea-predominant IBS were examined using an unpaired T-test. Data are expressed as means±SEM. The 40 IBS patients who met the Rome II criteria (table 1) were enrolled from October 2007 to August 2010. Forty per cent of patients (16/40) had diarrhoea-predominant symptoms, 27.5% (11/40) had constipation-predominant symptoms, and 32.5% (13/40) had alternating symptoms based on Rome criteria. None of the patients had surgery in the upper or lower GI tract and none of the patients had co-morbid conditions which would alter GI motility. Twenty-five patients (63%) had an abnormal LHBT at 180 min (figure 2B). The mean time to an abnormal LHBT was 87±9 min (range, 10–170 min) (figure 2). Fourteen patients (35%) also had an abnormal LHBT at 90 min (figure 2B). The mean time to an abnormal LHBT for this group was 54±6 min (range, 10–80 min). Fifteen patients (38%) had an abnormal LHBT using the double peak criterion (figure 2B). The mean time for the initial and second peak was 47±7 and 121±8 min, respectively. Analysis of the combined 99mTc scintigraphic and lactulose hydrogen breath test (LHBT). (A) Representative images at times 0, 30 and 50 min from a scan of a patient with irritable bowel syndrome (IBS). (B) A plot from the same patient showing the radioactive counts in the caecum over time (from region of interest, small ellipse in A.) and the LHBT. At 30 min (downward arrow), the test meal has reached the caecum as determined by the sharp increase in radioactive counts shown in B. The breath test was positive at 50 min (upward arrow) and total colonic counts (large irregular ellipse in right scan) / total body counts is 10%. C Shows the per cent accumulation of the 99mTc signal for all patients at the time the LHBT is positive. Five per cent was the threshold for a normal test (ie, colonic vs SIBO) but most patients had >10% accumulation before the breath test was positive. Of the 25 patients who had a positive LHBT, 22 (88%) had a negative LHBT/SOCTS (ie, ≥5% of total colon/total gut radioactivity at the time of the abnormal LHBT) with a mean total colon/total gut radioactivity of 26±12% at the time of abnormal LHBT (range, 5–57.4%) (figure 1C). In 91% of these patients there was ≥10% accumulation of 99mTc in the colon when the breath test was positive and in 59%, ≥20% accumulation had occurred. Since 88% (95% exact CI, 68.8% to 97.5%) of patients with an abnormal LHBT had a negative LHBT/SOCTS, we can reject the null hypothesis that ≤50% of LHBT positive patients have a negative LHBT/SOCTS (p=0.00078 one sided). Three of the 25 patients had a positive LHBT/SOCTS (≤5% of total colon/total gut radioactivity at the time of a positive LHBT). Two of these patients had a positive LHBT within 10 min of ingestion of the test meal. The mean time for positive caecal radioactivity in patients with an abnormal LHBT by 180 min, was 61±7 min (range=10–130 min) (figures 2,3). The mean accumulation of 99mTc in the colon at this time was 6.9±0.65% (range, 2.9–12.5%). In those patients whose LHBT was abnormal by 90 min (n=9), the mean time for positive caecal radioactivity was 41±6 min (range=10–100 min). Comparison of the time to a positive laculose hydrogen breath test (LHBT) and the oro-caecal transit based on 99mTc scintigraphic testing. (A) Time of abnormal LHBT (open circle) and 99mTc signal in caecum (closed circle) for each patient whose LHBT was positive by 180 min. In 22/25 patients, 99mTc is in caecum before the concentration of H2 (in ppm) is abnormal. Grey horizontal line at 90 min shows cases below the line that had a positive LHBT before 90 min. In all of these cases, the 99mTc reached the caecum before the rise in H2. (B) Correlation of LHBT and 99mTc scan for each patient. (R2=0.3327, p=0.0025). In the 22 patients who had a negative LHBT/SOCTS (ie, ≥5% of total colon/total gut radioactivity at the time of the abnormal LHBT at 180 min) the mean lag time between arrival of 99mTc in the caecum and an abnormal LHBT was 35±5 min (range 10–110 min) (figure 3A). In the three patients who had a positive LHBT/SOCTS, the mean lag time between abnormal LHBT and caecal radioactivity positivity was 40±25 min (range 10–90 min) (figure 3A). From the time of positive caecal radioactivity to an abnormal LHBT, the mean per cent increase from right colon/total gut to total colon/total gut radioactivity was 19±3% (range, 0.5–51.5%). 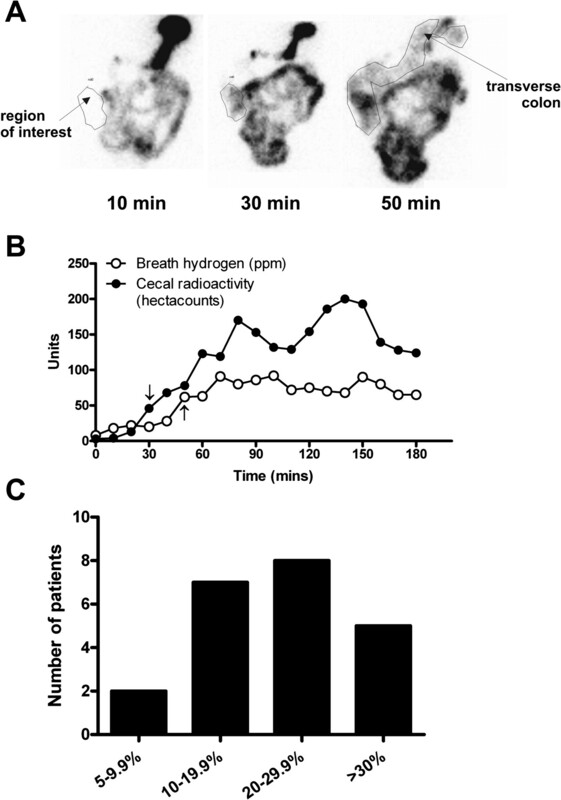 There was a very strong correlation between the timing of caecal radioactivity positivity and rise in H2 breath (abnormal LHBT) (figure 3B, p=0.0025). There was no difference in the mean lag time for the constipation group compared to the other groups (lag time=37±8.1 vs 34±7.4 min, respectively) or in the time to peak H2 production (time to peak=151±8.1 vs 135±12.3 min, respectively). The mean time required for positive caecal radioactivity (arrival of 99mTc meal in the caecum) for all patients with IBS was 71±7 min (range=10 to 220 min) (figure 4). The mean oro-caecal transit times were significantly longer for the constipation-predominant IBS group (n=13) compared to the diarrhoea-predominant IBS group (n=16) (figure 4B, p=0.0023). Oro-caecal transit time as measured by 99m Tc scintigraphy. (A) The oro-caecal transit time varies widely among all patients ranging from 10 to 220 minutes. (B) The mean transit time for the constipation-predominant patients with IBS (n=11) was 2.2 times greater than that for the diarrhoea-predominant patients (n=16). *p=0.0023. The proposal that the symptoms of IBS result from SIBO in the distal small bowel has been based on the findings of the LHBT.4 12 13 The basic premise of this test is that the only source of H2 gas production in the body is the fermentation of a carbohydrate substrate,22 such as lactulose, and that the migration of colonic type bacteria into the distal small intestine leads to a premature rise in H2 when the substrate reaches these bacteria.23 However, this test has not been carefully validated as a measure of SIBO7–9 22 and variations in transit time of the lactulose from the small intestine to the caecum could also account for these abnormal tests.2 7 17 The present study tested this possibility by using 99mTc scintigraphy to determine whether the rise in H2 occurred before or after the 99mTc had reached the caecum. We found that the 99mTc had reached the caecum in 88% (22/25) of the patients with IBS before the abnormal rise in H2 occurred. These data suggest that the abnormal LHBTs found in IBS patients using current criteria detect small bowel transit and not SIBO. We found that 63% of IBS patients in this study had an abnormal LHBT, using the criteria of an increase in H2 >20 ppm within 180 min. This proportion is very similar to those reported in a number of previous studies.13 15 16 24 Similarly, our finding that 35% of patients with IBS had an abnormal LHBT test using the H2 >20 ppm by 90 min is consistent with most previous reports.16 24 However, when these criteria were applied in healthy controls in previous studies, a similar proportion was found to have an abnormal test using either of the criteria.15 16 24 25 This lack of a difference between patients with IBS and healthy controls is consistent with the conclusion of our current study that the LHBT is measuring small-bowel transit time as opposed to SIBO. Based on these studies, we used a cut-off of ≥5% accumulation of 99mTc in the caecum to demonstrate that sufficient test meal had reached the caecum to account for the increase in H2 levels. In previous studies using combined LHBT as well as jejunal cultures to examine suspected cases of SIBO,18 a 5% cut-off for the 99mTc scintigraphy was also employed. This study differed by using the double peak criteria for interpretation of the LHBT and they found these criteria alone to be unreliable to diagnose SIBO. However, they did find that when the timing of the rise in H2 and caecal radioactivity were compared (ie, rise in H2 occurred before or after caecal radioactivity present), specificity for SIBO was 100%. In our study, the 5% cut-off proved to be a conservative measure, as we found that almost all patients had accumulated >10% in the colon and over 50% were >20% at the time the breath test was positive. In another study of healthy volunteers,26 a rapid rise in caecal radioactivity was used as a measure of oro-caecal transit and a strong correlation between the timing of a positive LHBT and the scintigraphic measurement of oro-caecal transit, similar to that found in our study (see figure 3). We also compared the lag time between the arrival of the head of the 99mTc meal in the caecum and the time the LHBT was positive and found that a mean time of 35 min (range 10–110 min) had elapsed. The studies described above17 21 demonstrated that this is sufficient time for fermentation and expiration of H2 in the colon to occur. When this data is taken together, our study provides very strong evidence that in the 88% of IBS patients where the LHBT was positive, sufficient test meal was in the colon to account for the abnormal breath test. A potential bias for some subjects is that we did not measure methane levels. Studies employing a whole body calorimeter have shown that sulfate and methanogenic bacteria consume H2 when measured over a 24 h period.27 This could influence the results of H2 breath testing although the potential impact of this on the LHBT has never been rigorously tested.28 It is known that the detection of methane in IBS patients is strongly correlated with constipation.13–15 Methane production has been reported in ∼ 40–60% of constipated IBS patients but it is unclear whether methane influenced the results of the LHBT in these studies. In the one study where the breath hydrogen profiles in diarrhoea-predominant and constipation-predominant subjects with IBS were compared during a standard LHBT,13 no differences at any time point over 180 min were seen, despite the fact that almost half of the patients with constipation were methane producers and none of the patients with diarrhoea produced methane. Whether this reflects that the predominant species of methanogenic bacteria, Methanobrevibacter smithii, are reported to be found largely in the left colon29 30 and hence would not initially be in contact with lactulose during a LHBT, is unknown. Although methane levels were not measured in the current study we did compare the lag time between the time of arrival of the test meal in the caecum and the rise in H2 and the time to peak H2 levels between the constipation group and the diarrhoea and alternator groups. Neither of these measurements demonstrated meaningful differences, suggesting it is unlikely that methanogenic bacteria had significantly altered the H2 levels detected by the LHBT in the constipation-predominant IBS group. Our analysis of oro-caecal transit time in IBS subtypes showed it was significantly increased in patients with constipation-predominant IBS (figure 4B), as reported by others.31 32 While the explanation for this finding is unclear, the production of methane gas is highly correlated with the symptom of constipation, as described above. Interestingly, animal studies33 have shown that methane gas can reduce antro-duodenal motility. Furthermore, in a retrospective human study comparing methane production and antro-duodenal motility,33 methane production was associated with an increased motility index compared to patients producing H2 gas. Thus, it will be interesting in future studies with combined LHBT/SOCT to also measure methane gas and correlate the findings with oro-caecal transit times. In summary, we have shown that the defined rise in H2 in IBS patients undergoing the LHBT results from lactulose reaching the caecum, where this carbohydrate substrate would be digested by colonic bacteria. The IBS–SIBO hypothesis has led to widespread use of antibiotics in some countries. Studies examining the impact of antibiotics on IBS symptoms had shown modest benefit confined largely to reductions in bloating.34–36 When the current study and previous studies are taken together, including 24 h calorimetric studies suggesting that H2 gas originates from the caecum in patients with IBS,34 it seems probable that antibiotics reduce bloating in IBS patients by suppressing species of colonic bacteria in the colon, not bacteria in the small intestine. Further studies are needed to confirm this hypothesis, and if so, altering specific colonic flora using alternative strategies to antiobiotics, such as pre or probiotics, may prove advantageous in some IBS patients.
. Irritable bowel syndrome. Intern Med J 2006;36:724–8.
. Predictive value of the Rome criteria for diagnosing the irritable bowel syndrome. Am J Gastroenterol 1999;94:2912–17.
. Irritable bowel syndrome: toward an understanding of severity. Clin Gastroenterol Hepatol 2005;3:717–25.
. Bacterial concepts in irritable bowel syndrome. Rev Gastroenterol Disord 2005;5(Suppl 3):S3–9.
. Irritable bowel syndrome: bacterial overgrowth–what's known and what to do. Curr Treat Options Gastroenterol 2007;10:328–37.
. Interactions between commensal bacteria and gut sensorimotor function in health and disease. Am J Gastroenterol 2005;100:2560–8.
. The lactulose breath test for diagnosing SIBO in IBS patients: another nail in the coffin. Am J Gastroenterol 2008;103:964–5.
. Lactulose breath testing, bacterial overgrowth, and IBS: just a lot of hot air? Gastroenterology 2003;125:1898–900.
. Antibiotic use, childhood affluence and irritable bowel syndrome (IBS). Eur J Gastroenterol Hepatol 1998;10:59–62.
. Antibiotics increase functional abdominal symptoms. Am J Gastroenterol 2002;97:104–8.
. Normalization of lactulose breath testing correlates with symptom improvement in irritable bowel syndrome. a double-blind, randomized, placebo-controlled study. Am J Gastroenterol 2003;98:412–19.
. Methane production during lactulose breath test is associated with gastrointestinal disease presentation. Dig Dis Sci 2003;48:86–92.
. Lactulose breath testing does not discriminate patients with irritable bowel syndrome from healthy controls. Am J Gastroenterol 2008;103:958–63.
. Detection of bacterial overgrowth in IBS using the lactulose H2 breath test: comparison with 14C-d-xylose and healthy controls. Am J Gastroenterol 2005;100:1566–70.
. Investigation of small bowel transit time in man utilizing pulmonary hydrogen (H2) measurements. J Lab Clin Med 1975;85:546–55.
. Functional gastrointestinal disorders in Canada: first population-based survey using Rome II criteria with suggestions for improving the questionnaire. Dig Dis Sci 2002;47:225–35.
. 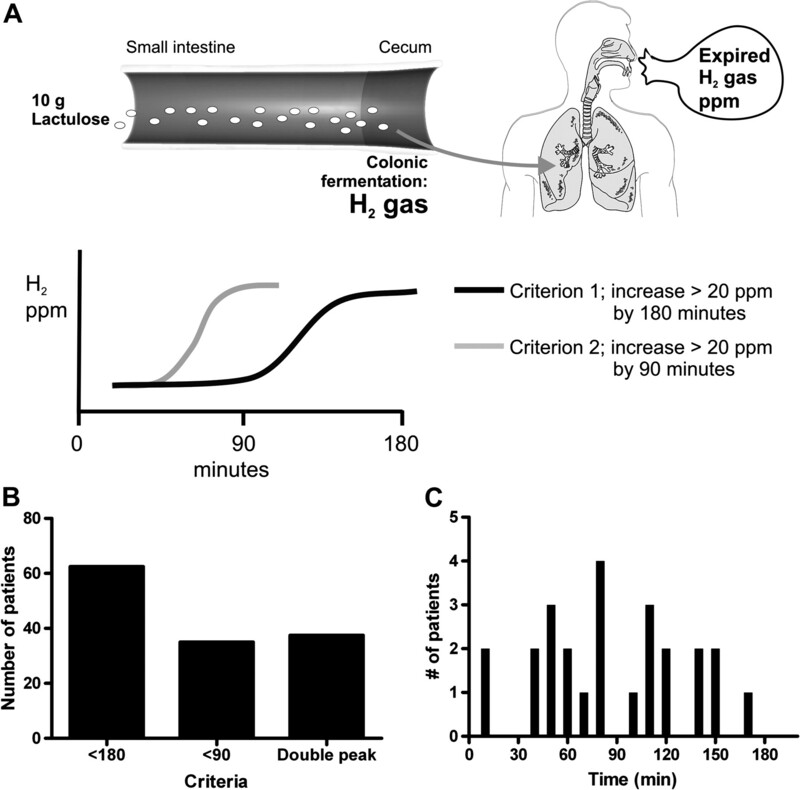 The lactulose hydrogen breath test as a diagnostic test for small-bowel bacterial overgrowth. Scand J Gastroenterol 1979;14:333–6.
. Interpretation of the breath hydrogen profile obtained after ingesting a solid meal containing unabsorbable carbohydrate. Gut 1985;26:834–42.
. Use and abuse of hydrogen breath tests. Gut 2006;55:297–303.
. Small intestinal bacterial overgrowth: a framework for understanding irritable bowel syndrome. JAMA 2004;292:852–8.
. P. Lactulose hydrogen breath testing (LHBT) in patients with IBS and controls: differences in methane (CH4) but not hydrogen (H2). Am J Gastroenterol 2006;101:S479. Ref Type: Abstract.
. Scintigraphic determination of the effect of metoclopramide and morphine on small intestinal transit time. Am J Physiol Imaging 1988;3:201–4.
. Production, metabolism, and excretion of hydrogen in the large intestine. Gastroenterology 1992;102(4 Pt 1):1269–77.
. Methodology and indications of H2-breath testing in gastrointestinal diseases: the Rome Consensus Conference. Aliment Pharmacol Ther 2009;29(Suppl 1):1–49.
. Pyxigraphic sampling to enumerate methanogens and anaerobes in the right colon of healthy humans. Gastroenterology 1993;105:1281–5.
. Comparison of fermentation reactions in different regions of the human colon. J Appl Bacteriol 1992;72:57–64.
. Irritable bowel syndrome: relationship of disorders in the transit of a single solid meal to symptom patterns. Gut 1983;24:405–11.
. The relationship between symptoms, body mass index, gastrointestinal transit and stool frequency in patients with irritable bowel syndrome. Eur J Gastroenterol Hepatol 2010;22:102–8.
. Methane, a gas produced by enteric bacteria, slows intestinal transit and augments small intestinal contractile activity. Am J Physiol Gastrointest Liver Physiol 2006;290:G1089–95.
. Do interventions which reduce colonic bacterial fermentation improve symptoms of irritable bowel syndrome? Dig Dis Sci 2005;50:758–66.
. The effect of a nonabsorbed oral antibiotic (rifaximin) on the symptoms of the irritable bowel syndrome: a randomized trial. Ann Intern Med 2006;145:557–63.
. A randomized double-blind placebo-controlled trial of rifaximin in patients with abdominal bloating and flatulence. Am J Gastroenterol 2006;101:326–33.